June 2003)  Around sunset on Sept. 3, 1812, a small settlement in Scott County, Ind., known as Pigeon Roost was attacked by a group of a dozen Shawnee warriors. In the space of one hour, 24 people were slaughtered, most of them women and children. Only one family escaped to spread the alarm, reads a memorial sign erected at the sight near the Scott-Clark county line just north of Underwood. What has become known as the Pigeon Roost Massacre will be re-enacted by the Painted Stone Settlers on Saturday, June 14, during the 121st Old Settlers Days in Lexington, Ind. Originally called the Old Settlers Meeting, the event was first held in the late 1800s. During the early years, families came by horse and carriage from miles around to enjoy a day of public speeches, horseshoe pitching and visits with old friends. And while a lot has changed in Scott County since then, what hasnt changed is the embodiment of community spirit that has characterized the event since its beginning. In 1926, the meetings were moved to the public square, Lexington School yard, where electricity was available. At that time, the event was sponsored first by the American Legion and later by the Lexington Parent-Teacher Association until the mid-1960s, when the Nabb and Lexington Volunteer Fire Departments began joint-sponsorship. The Lexington Volunteer Fire Department still sponsors the current-day event in conjunction with the Scott County Visitors Commission. Old Settlers Days will begin at 6 p.m. on Friday, June 13, with a bluegrass and country music concert. Activities will continue on Saturday beginning at 11:30 a.m. with a parade, followed by kids games, the Painted Stone Settlers re-enactment, a Little League auction and a talent contest for individuals from ages 13-21. Last years winner, Elliott Brown, won more than $1,200. On Saturday evening at 7 p.m., fiddlers from around the area and neighboring states will perform in a fiddle contest. After the contest, bluegrass band James White and Deer Creek will perform. Arts and crafts, food, a flea market, a car show, antique tractors and machinery and kids rides will also be offered throughout the day. 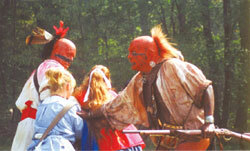 The Painted Stone Settlers will begin their re-enactment of the Pigeon Roost Massacre at 2 p.m. on June 14. Rick Geary, a Painted Stone member who researched the massacre and organized the groups rendition of the horrific event, will narrate the re-enactment. It was really one of the last Indian massacres in Indiana, Geary said. The Pigeon Roost settlement was comprised of a group of about 12 families who moved from Nelson County, Ky., to settle in Indiana, according to Geary. The massacre occurred during the War of 1812 when the majority of the settlements men were gone off to war, he said. In a vulnerable state, the remaining settlers were caught off guard. This area was pretty well settled by 1812 and people didnt think theyd ever have to deal with Indian attacks again, said Geary. The cause of the attacks has been debated. Some historians believe that settlers had cheated and stolen from the Shawnee, leading to contention, but no one knows for sure. This is the first time the Painted Stone Settlers will re-enact the event, which will be performed roughly like a play, Geary said. Back to June 2003 Articles.